I thought I might have trouble meeting my targets for this month as I was away from home for a substantial chunk of the month. 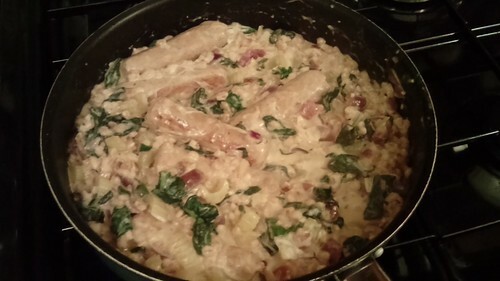 However, it turned out that the spells away from home would end up acting as motivators, as I ended up cooking both my target items out of the need to use up food I had in the house before I went away for a week. First up I made what turned out to be a massive pot of veggie chilli. 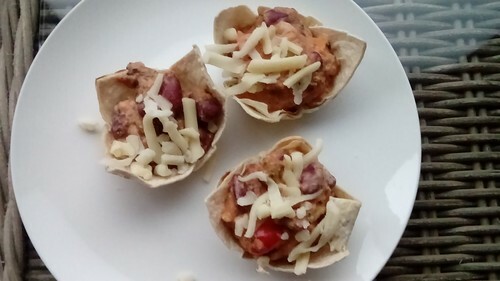 The recipe in question was actually Baked Sweet Potatoes with veggie chilli, which was utterly delicious, but I did end up making a variety of other dishes with the leftover chilli. 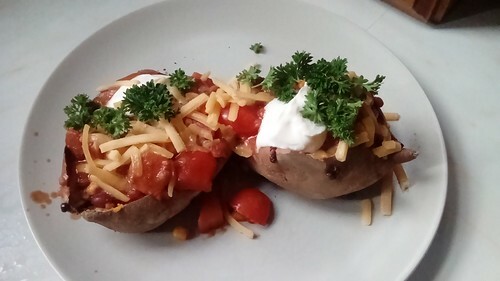 (Or to give the dish its full name – Baked sweet potatoes stuffed with a hot bean and lentil chilli with red peppers and port. Except it was cheap red wine rather than port.) I think I’ve almost mastered the art of successfully spicing my chilli without the aid of one of those packet spice mixes. I’ve been a bit disappointed in some of Lorraine’s other takes on ‘chilli’ but this one is pretty good, though I heartily recommend adding a few large mushrooms and draining your chopped tomatoes before adding to the chilli wouldn’t go amiss. Also the recipe suggests fresh parsley if you don’t have any coriander – or like me, you’re one of those people for which it tastes like soap – and having a glut of the same in my herb garden I was delighted to find that works extremely well. June’s monthly bake was once again brownies. This time they were pear and dark chocolate. 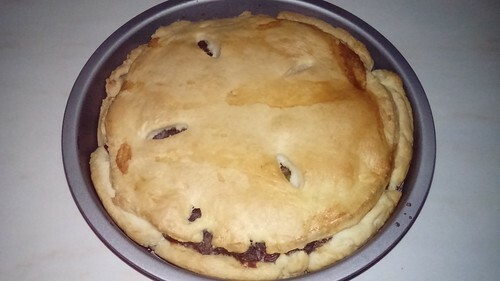 It was an adaption of a raspberry and chocolate brownie recipe. Last month I bought some small pears and though they took a couple of weeks to ripen, once they did they were delicious and I absolutely didn’t mind heating two a day for a week when they all ripened at once. So I bought another bag of the exact same pears and, naturally, after 3 weeks – including one with a bunch of bananas sitting on top of them – they remained brick hard. Unfortunately a lot of recipes that involve pears state silly things like ‘use two perfectly ripe pears’ as though everyone I know who cooks pears is only cooking them because they won’t ripen! So I gave up and poached them (Japanese-style in mirin with star anise) and stuck the poached pears into the brownie mix. 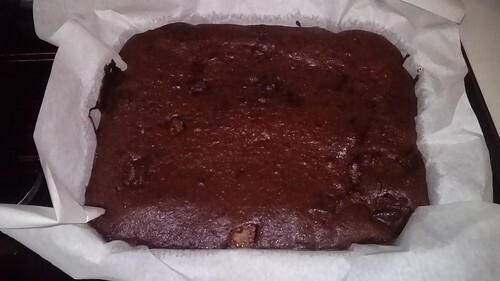 I like this brownie recipe better than the one for the beetroot brownies, because you melt everything in a pot rather than trying to blend the room temperature ingredients in a blender – eminently more sensible in my opinion. Though if I make them again I think I’ll add cinnamon – I’d normally use cinnamon sticks when poaching the pears but I couldn’t find any until I turned up a box hiding behind the brown sugar and by then it was too late.